Group cancellations must be made 2 weeks in advance to not be charged the amount due the hostel. Cancellation notices between 1 and 2 weeks will be charged 50% of the first nights stay. Less than 1 week and the entire first nights stay will be charged. Niagara Falls' Friendly Home Away From Home! 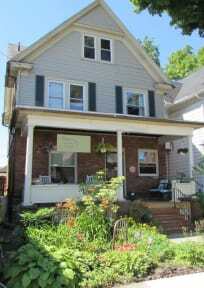 Located 1 block from the Niagara River Gorge, a short walk to the Falls along the gorge, and 3 blocks from public transportation and the supermarket. We are the perfect choice for Niagara Falls travelers who prefer inexpensive and comfortable accommodations in a cozy and friendly home environment to the sterile and isolating atmospheres of large hostels and expensive hotels and motels. We also HAVE AIR CONDITIONING so you can have a good nights sleep. 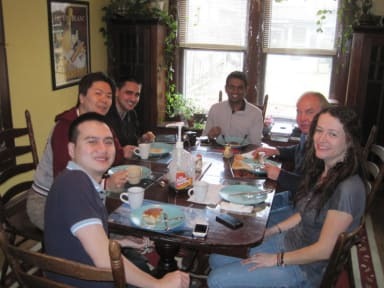 Our guests love meeting new people and are open to shared accommodations and communal living. * Relax in the common areas, like the diningroom, livingroom, porch or yard. * Prepare your own meals in the well-appointed kitchen. * Meet other travelers, make new friendships, and enrich old ones. * Get free tourist tips and information from the staff and fellow travelers. * Participate in group activities like guided tours, bike rides, picnics, and potlucks. * Start your day with fresh coffee & tea. * Enjoy the library and exchange books.. Whether you're traveling solo or in a group, our amenities let you improvise the perfect mood for whatever activity you decide to pursue. Read in the library. Share travel experiences with the other hostellers. Play games. Cook yourself a meal in the kitchen, or out on the BBQ. After taking in the spectacular views and the local attractions, Wanderfalls is the place you'll love to return to at the end of the day. It's just like coming home! We're just three blocks from the bus depot. And if you travel here by car, parking is available both on the property and street right out front. The Falls are 1 mile away, an easy walk from here, en route to some fun tourist stops, a neighborhood grocery store, post office, shops, and restaurants. Taxes of 8% for dorm beds and 13% for the private room are not included in the price. In order to keep prices low, cash only please. Check in is between 4 pm and 9 pm. However, we do not have regular office hours so you need to let us know what time you plan on arriving so we can be sure to be here. Arrivals after 9 pm must be approved in advance and there is a $10 late check-in fee. There are no check-ins after 11 pm. Please let us know what time you plan to arrive and if you need any directions. Great location! Carroll is very nice! If you want to stay in Niagara Falls, here is the best one.